"Having a more sensitive telescope, we can receive weaker and more distant radio messages," Wu Xiangping, director-general of the Chinese Astronomical Society, was reported as saying. "It will help us to search for intelligent life outside of the galaxy and explore the origins of the universe." China has started assembling the world's largest radio telescope, which will have a dish the size of 30 football pitches when completed, state media reported as Beijing steps up its ambitions in outer space. The five-hundred-metre Aperture Spherical Radio Telescope (FAST) nestles in a bowl-shaped valley between hills in the southwestern province of Guizhou, images posted online show. Technicians began attaching 4,450 triangular-shaped panels to the telescope's reflector on Thursday, the official Xinhua news agency reported. FAST will be the world's largest single-aperture telescope, it said, overtaking the Arecibo Observatory in the US territory of Puerto Rico, which is 305 metres (1000 feet) in diameter. For years Chinese scientists have relied on "second hand" data collected by others in their research and the new telescope is expected to "greatly enhance" the country's capacity to observe outer space, Xinhua said. Beijing is accelerating its military-run multi-billion-dollar space exploration programme, which it sees as a symbol of the country's progress. It has plans for a permanent orbiting station by 2020 and eventually to send a human to the moon. The dish will have a perimeter of about 1.6 kilometres, Xinhua said, and there are no towns within five kilometres, giving it ideal surroundings to listen for signals from space. The region's karst topography — a landscape of porous rock fissured with deep crevasses and underground caves and streams — is ideal for draining rainwater and protecting the reflector, it added. Construction on the telescope started in March 2011 and is scheduled to finish next year, Xinhua said. 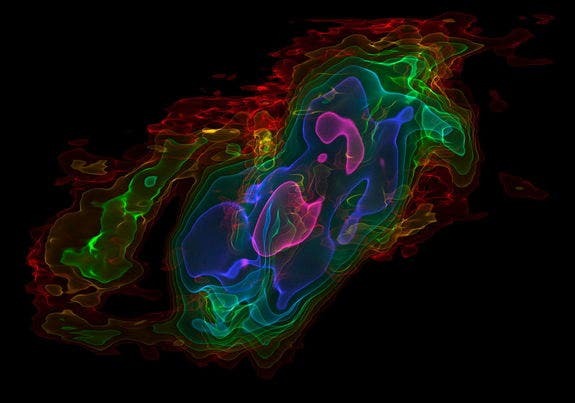 The picture at the top of the page shows a view of a three-dimensional visualization of gas in the nearby starburst galaxy NGC 253 (The Sculptor Galaxy) as observed by the ALMA radio telescope in Chile.